First of all I finished my hexagon quilt top this weekend. It came together really quite easily. Why was I so scared of hexagons?! 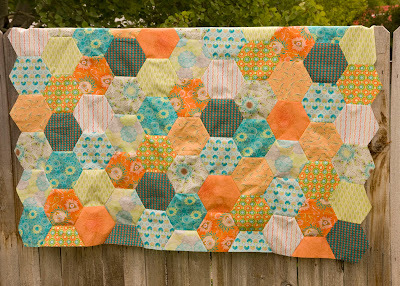 I adore this quilt and will definitely machine piece hexagons again. I wouldn't suggest this for a first time quilt, but these hexagons are not hard. Also, I have decided to join up with Farmer's Wife Quilt-Along over at Fussy Cut. I've wanted to do a traditional sampler for quite a while. I love the variety of these blocks, plus I know it will be a great challenge. I'm having serious debates about fabric. 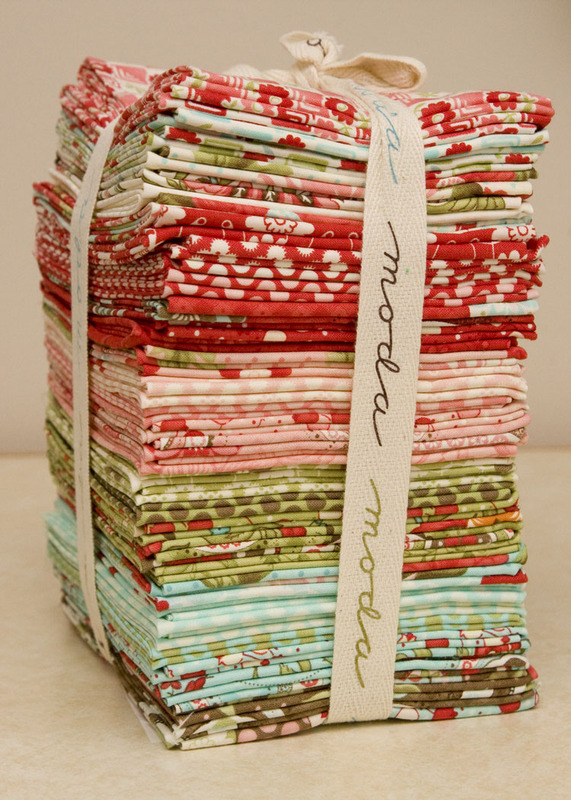 I might break open my Bliss FQ stack for this quilt. I might use my DS stack with some other fabrics mixed in. Or I might just do scrappy. I can't decide. Finally, I have another little fun thing to give away this week. Here is a 2.5" stack of Little Apples. Just leave a comment to be entered. I'll randomly pick the winner on Friday. I'm sure whichever fabric you choose will be gorgeous. I'm kind of partial to the Bliss for the sampler quilt though. Can't wait to see what you do. Bliss is a fun fabric to work with. You can't go wrong there! Your quilts always look so lovely! 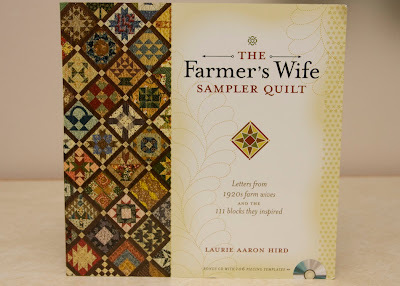 I can't wait to see what you do with the Farmers Wife sampler quilt! Your work is beautiful! I love those tiny fabric stacks. So cute. i can't wait for little apples to debut! Love the hexagon quilt - so cool. And the tiny little squares are terrific. Thanks for the opportunity to win some.....piece. I love the hexagons. I bet you love this quilt for the color scheme too. Love the hexagon quilt. Love the idea of using Bliss and love the little apples! It might be hard to crack open the Bliss - it would be for me. Those FQ bundles are so pretty to look at - LOL. i've never attempted a hexagon quilt before.. yours looks great! i would go with the Bliss for the farmer's wife quilt, possibly with a few coordinating solids mixed in. Oh lordy, real-life Little Apples - thank you for the opportunity! I think we can safely assume that whichever fabric you choose, your quilt will turn out to be a stunner! Your hexagons look great. I love Bliss, but any of those choices would look great. I would love to see the quilt along blocks in that Bliss! It is so pretty! And those little apples..too cute! I would LOVE those little apples! 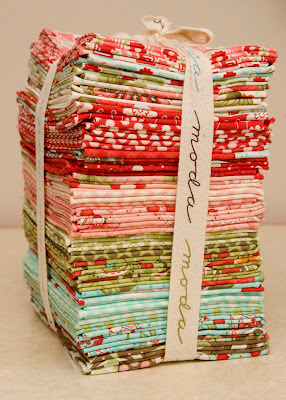 Wish MODA sold those little stacks! I love how the hexagon quilt turned out. It looks beautiful! I like the Bliss for the QAL! Thanks for the giveaway! Love the hexies. :) And Bliss is a favorite of mine, for sure. I have some bliss and Denyse Schmidt too! =) I think I'll be cutting into mine soon! Love the colours in that hexagon quilt! Looking forward to seeing you farmers wife sampler blocks! So fun!!! I'm thinking about caving in to the Farmer's Wife QA, too, I just picked up the book from the library today. 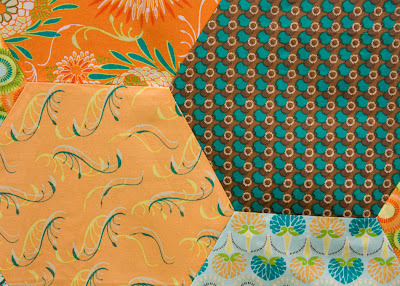 I like the idea of your DS fabrics, since they're vintage-inspired and everything. :) I adore your machine-pieced hexies, I definitely want to try that!! I've been tempted by the QA too. Seeing the book on sale at JoAnn's this weekend is ALMOST what broke me down! Hmm, and now I'm thinking of heading back there to get it. I vote for using your Bliss stash. I think it would be so pretty! Thanks so much for the giveaway, this new line looks so cute! Your hexagon quilt is perfect!.....and thanks for the chance! I only have a charm pack of Bliss but I love it - it would be a great choice!! Looking forward to Aneela's new line! Love the quilt - I have one I need to finish. Would love to have that cute little 2 1/2 sq pack - what fun! I've never seen a 2.5" charm stack before! I wonder what cutesie bake shop name Moda has for those!! Little squares of Little Apples. Cute! You've made me want to make a hexie quilt. I need to go find the tutorial about how to machine sew them together instead of sewing them together by hand. THAT is the only way I'll end up making one of these quilts. I don't know how you haven't opened up your Bliss FQ stack. I'd be making some serious love to that fabric. Seriously. Hmmm....now where did I see that tutorial for sewing these hexies together by machine instead of hand? Love the hexagon quilt! Thanks for the chance to win such a cute wee bundle! Yay! Love it! The corners are fantastic looking! LOVE YOUR HEXIE QUILT TOO! As I've not long ago got hold of Sherbet Pips, having some "Little Apples" would be a dream! Thanks for the giveaway! oh, can't wait to see your version of Farmer's Wife blocks. Machine quilting hexies?! I didn't know that was possible. I'd love to see how you did it. All these blog posts about the farmer's wife quilt-along are really making me want to join in. But I have enough projects on the go at the moment...and a baby due in 5 weeks! I love the Little Apples line! Thanks for the chance to win some. Oh I do love these fabrics...well, really, all of her fabrics! i just can't resist 2.5" squares. i bet you didn't know, but i cut ALL of my scraps into 2.5" squares. it just seems like the right thing to do. 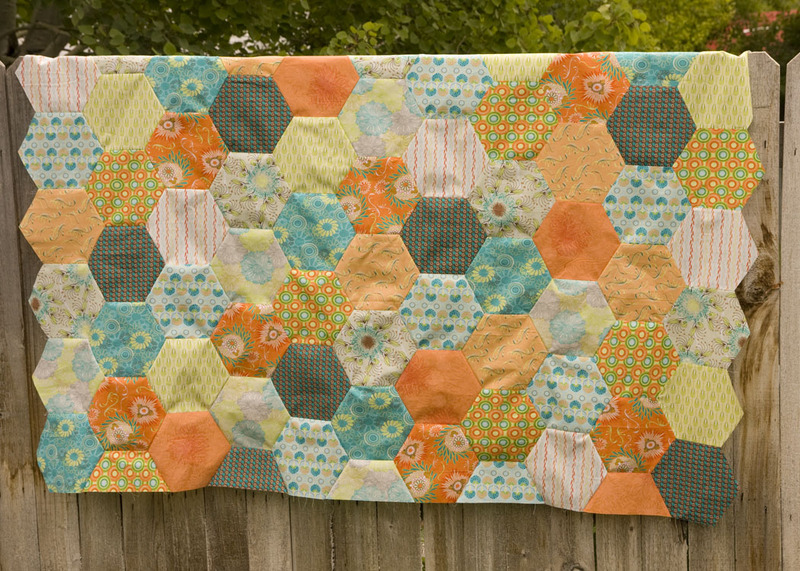 love the hexagon quilt top! I'm a "fool" and am handpiecing a large hexagon quilt myself... and those 2.5" squares would go RIGHT into that! I am loving the DS fabrics. We have so few of them here in our area, but what I've seen, it's a winner. Thanks for the giveaway. I love the idea of going scrappy with the farmer's wife quilt along. I also love the chance to win some little apples charms. Your hexagon quilt is gorgeous! ...those are some adorable teeny tiny 'little apples'! Your hexagon quilt is really pretty. As long as the hexies aren't too small, they're probably do-able on a sewing machine. I've started experimental sewing with my DS Collection fabrics. I'm putting the blues and greens (didn't buy reds) with hot pink! Thanks for this lovely giveaway. Fabric is always the best! Sweet quilt! Love the color combo and the hexagons. I have had the little apples fabric on my wish list so I hope I win. The Farmer's Wife qal is so inviting. The blocks I've been seeing look great. Little Apples is a lovely collection. Thanks for the giveaway. I think this would be awesome in Bliss! Sweet hexi quilt! I'm looking forward to seeing it finished up. The Farmers Wife QA would be amazing to do in Bliss! Bliss would be great. I'm doing mine with a bundle of Wiscasset, but I'm not sure it's going to be enough. Lots of people doing the Farmer's Wife quilt! I just might have to look for the book too. Love those 2.5" squares, and could definitely put them to good use. I'm watching the Farmer's Wife quilt along and am enjoying seeing all the different squares. I think scrappy, with one or two anchor colors, would be very cool. I love your hex quilt, the colour combination is great! I'm fighting the urge to join the farmer's wife quilt along, too. I really don't like samplers, but the pressure is getting to me. What a beauty! Those colors are great together, I'm with you, machine piecing all the way, looks great!! I love your hexagon quilt but all those y-seams scare me a bit. Don't think I will be trying them anytime soon. I am way too impatient for that. Great job though!! There are a great number of people joining that Farmers Wife QAL I wish I had the time to commit to it but that is just not possible right now. I think the DS fabrics would give it a nice punch of fun! I can't wait to see your famer's wife quilt, all of your work is fantastic! And the little little apples are really cute! I love your stash buster quilt from a few posts ago. The DS fabric is beautiful, i'm smitten. I love your hexie quilt - I'm really nervous to try that - you did a beautiful job. Thanks for the chance to win!! I would love to see those Little Apples in person and make something out of it! I love your hexie quilt! I especially like the idea of machine piecing them! Thanks for the giveaway! sooooo so excited for this fabric to come out!!! I watched a tutorial the other day on machine piecing hexagons and I think I'll start with a pillow. Your's looks wonderful! Oh how could you bear to part with those beautiful little apples....but if you want to send them my way, I'd be ever so grateful! The Farmers Wife sampler quilt never really appealed to me because of all the dark colors. Why didn't I think about doing it in all the great modern fabrics out now? I think yours will be beautiful if you decide to go with Bliss. I'm putting the sampler on a back burner for the future. I'd love to be entered for the giveaway. Love the hexagon quilt! I think Bliss is a great choice for the Farmer's Wife quilt. Your hexagon top looks great! I think bliss would work nicely too because of some of the traditional elements in that line. But, then again, the DS fabrics would look nice too. Good luck deciding. How big are your hexagons? That is one great looking quilt! Hexagons look scary to me. Such ambitious project you tackle! I hope to aspire to such quilting confidence some day. You make me want to tackle some hexagons! Love the hexagon quilt - beautiful! Love how your hexagons turned out!Looks really great!Might have to try myself to machine piece some! Love your hexie quilt, thanks for the chance to add to my stash. I'm starting the Farmer's Wife quilt along too! Love the giveaway, how fun! And your hexagons are beautiful!!!!! Everyone is having so much fun with that Farmer's Wife quilt along, I'll have to pick up the book! Little Apples is such a cute line! Please count me in, thanks! Those fabrics would all work for the Farmer's Wife quilt. I am trying to decide what I will use too. Also, that tiny charm pack is so cute, thanks for the giveaway! 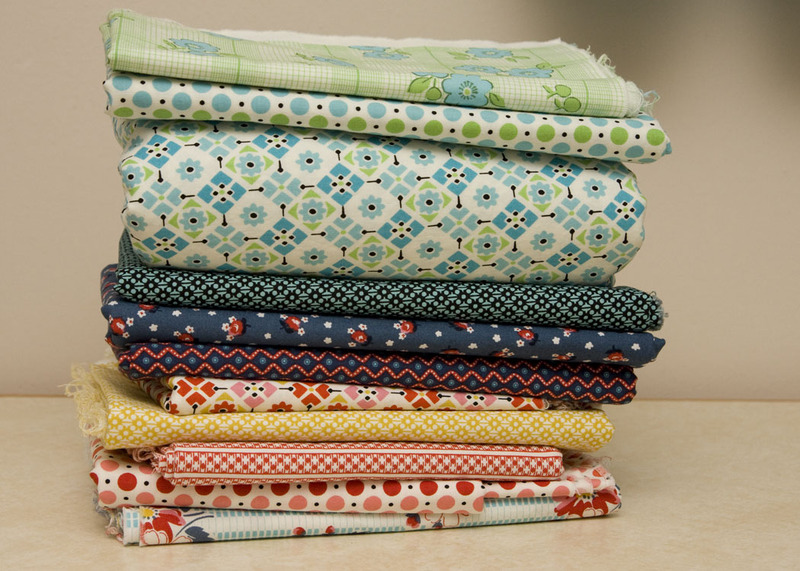 I love the hexi quilt - and the bliss - and what a lovely little bundle of fabric! Thanks for the chance. the hexi quilt is so cute!! can't wait to see it quilted. Have a wonderful day! I love that hexie quilt! I like the edges like that, nice work! thanks for the chance! 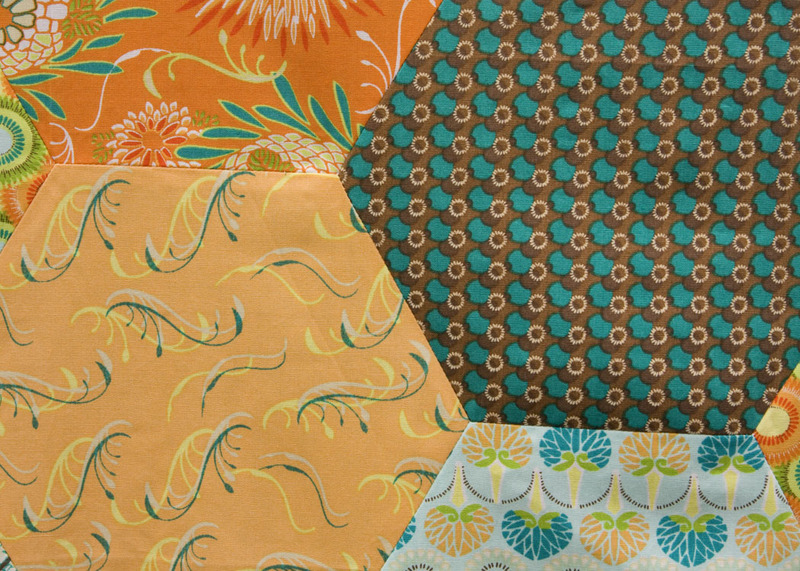 I guarantee if you use your Bliss fabrics you'll love them even more in your quilt than bundled together. Go for it! Shoot how to I comment and not be included in the giveaway!!! Go with both woman on the fabric!! Fun! The Farmer's Wife scares me a bit with all those templates. I am interested to see how it goes for you! I love your hexagon quilt! I might have to try it! Beautiful quilt! I for sure would open the Bliss for the quilt - it would be lovely either way though! thanks for the cute giveaway! I think the Bliss would look wonderful. And I love your hexagons! Thanks for the giveaway. Break opne Biss and have a blast - that's what I say!! Thanks for this giveaway,these wee charm packs are sooooo cute! Wow! the hex quilt turned out great! thanks for saying hexagons are not too scary- maybe i will talk myself into making a quilt with them sooner rather than later! How fun. Thanks for the opportunity. I'm loving the hexagons- they have always seemed so intimidating to me! 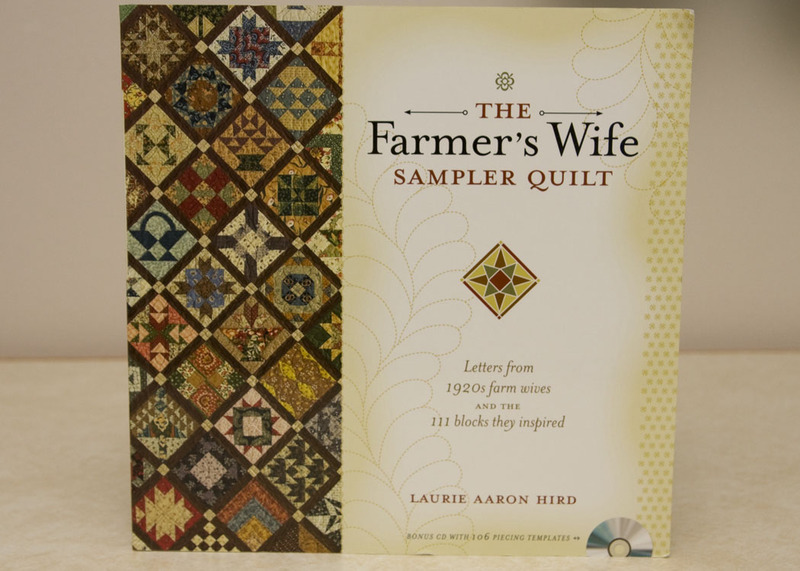 I can relate to wanting to do a sampler like the Farmer's Wife, it appeals to me too. I'm inclined to agree with your DS stack and maybe even scrappy if it were my choice..but your fabrics are lovely and whatever you make will be special. I just love the Little Apples! What a great prize! 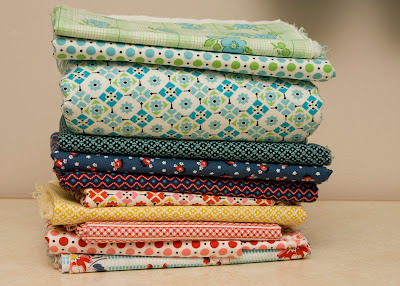 I think I like the Bliss best for the sampler, but I also love the idea of a more scrappy quilt, hmmmmmmm. And those little apples really need to live with my stash for a while! I love those little packs of little apples, so cute! Your hexie quilt is fabulous! I just found your blog- oh, what I've been missing! Beautiful quilts! Would love to use those Little Apples! What a beautiful quilt! Thanks for the giveaway! Wonderful hexagon quilt! I've been thinking about making a Farmer's Wife Sampler quilt. I was even toying with the idea of hand sewing all the blocks. famers wife quilt would be great in either stack of fabrics! Little apples for me?? Yes, please enter me into the drawing. I'm making a gfg hand pieced hexie quilt. How are you going to quilt your hexagon quilt? The orange fabrics look great in your quilt. wow, 113 comments, you are becoming too popular! Can't wait to see what you bring tomorrow night to show off! I am looking forward to Little Apples! What a wonderful prize. Thank You. I'm partial to the idea of doing The Farmer's Wife in Bliss. It would make your quilt really different from most of the other blocks that I've seen (mostly in reproduction fabrics) Good luck in your decision making! Thanks for the fun giveaway! i think the Bliss would be wesome for your quilt. and I love apples - Little Apples! thanks for the chance. your hexie quilt is gorgeous! i would love to win the little apples - thanks for the giveaway! Oh, I'm so tempted by the FWQ quiltalong! The blocks are great. But I have so much going on... We'll see how long it takes for me to break :) I'm sure yours will turn out great! your hexagon quilt is so lovely. i've never tried machine piecing hexagons, but now perhaps i'll give it a try. 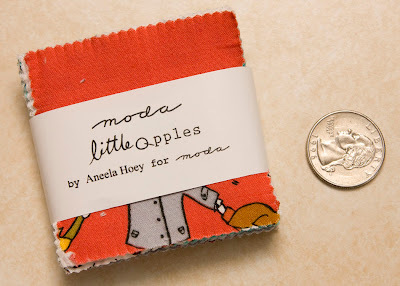 the little apples fabric is adorable, too, and i'd love to win! The hexagons look a little to advanced for me , but sure could handle those cute little apple squares! i love your hex quilt. and i'd love to have some fun with those tiny apples!